Riders Need to Slow Down According to New Rules: Is This The Solution? More new rules that attempt to slow riders down in endurance will be presented to the FEI General Assembly in 10 days’ time, following “official” research which shows the bleedin’ obvious: go too fast for too long and you will break your horse’s leg. One proposed rule will add a further seven days mandatory rest if the horse has exceeded 20kph. By a not very amazing coincidence, that is the top speed “window” adopted by the Boudhieb Initiative, which is quietly gaining support and reaping positive results in other parts of the world. But does anyone seriously think an increased rest is going to give the Group 7 (Middle East) riders and their copyists around the world a moment’s thought when belting along at 37kph at the end of a 120km race? A slightly longer lay-off won’t matter one jot when you have hundreds more horses to drag out of the barn. UAE current registrations have just topped 7,000 – 7015 to be precise – 48.92% of the global population of active FEI registered endurance horses (14,339), without including the hundreds of UAE-owned horses administered by other national federations. This has risen from 46.79% since I wrote about this alarming trend in September. Seriously, why bother to stage a world endurance championship? The other nations surely can’t have any competitive horses left. Do Group 7 riders even know the 20kph/longer rest rule is coming in? If so, they are unfazed. In the first three weekends of this 2017-2018 desert season, the winners’ final loop speeds were on average 5kph faster than at the equivalent rides last year. It won’t be long till 40kph is the norm. The global sport is merely a conveyor belt producing horses for destruction in the desert. We haven’t had any new high profile (if that’s quite the right term) doping scandals, ringers, fraudulent results, multiple deaths so far this fall, but there is still much that is very wrong on the field of play. And there always will be, for a simple reason. The larger volume of rule breaches will go unpunished as long as the FEI is not empowered to over-rule questionable on-the-spot decisions of ground juries, whether it be from turning a blind eye, failing to know the rules or simply not finding out about a heinous act in time. The sanctity of the field of play decision is OK for something in an arena where all the judges and all the spectators can see the horse for the entire duration of its athletic effort. But it was specious to ever think this could work in endurance. A slew of offences can be taking place 30km away from the ground jury at any given time. Violations spotted on the live-stream often go unpunished – and anyway, those cameras only focus on the leading pack. If you break FEI endurance rules, just hold your breath till 30 minutes after the official results have been posted. If no one else has noticed by then you are home free. It is utter pants. Video or photographic evidence may not emerge until the next days or weeks, after the snapper has sorted through his thousands of images and untold hours of film. 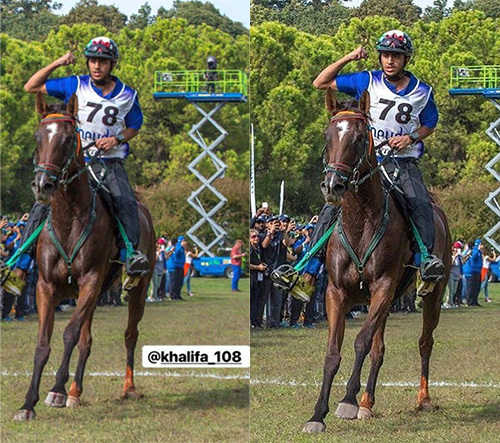 The shameless swap of the two Marmoogs by former world champion Sheikh Hamdan al Maktoum in 2012 eventually went unpunished on a legal technicality: the incriminating pictures were not spotted till 18 months later, despite being available online all that time. Two examples of evidence turning up too late both come from the young riders world championship at (Dubai-sponsored) Valeggio sul Mincio near Verona, Italy, six weeks ago. It was overall a demoralising affair, suggesting that not only have reformers lost the hearts and minds of the current generation, but of the next one, too. But the still images (below) show what looks like blood down both forefeet. They went viral. Blood isn’t, to date, a disqualifiable offence in endurance, but surely the chances are remote of blood trickling accidentally from identical spots on two coronet bands. There was plenty of speculation on social media – including some from vets – as to the cause. UAE team members Khalifa Ali Khalfan al Jahouri and 8 Minute. But wasn’t this a case for FEI HQ to investigate the blood further, as there is certainly something in the rules about invasiveness? Well No, because the ground jury told the FEI they did not see any blood when the horse was eventually presented for final inspection, and their decision is Final, whatever picture evidence emerges weeks/days/hours later. That’s the rule; end of story. Meanwhile, one of the original posters who appears to be a buddy of al Jahouri removed the bloody-feet picture from his Facebook page. Others then re-appeared elsewhere with the blood mysteriously missing. It emerged Valeska had a fracture – now allegedly repaired by surgery – and al Rowaie was handed a yellow card for Abuse. The rider, still only 19, was also yellow-carded for Abuse and “not conforming to many rules” last year. Many would think a life ban is the right punishment for pressing a horse with a broken leg, but first things first. The feeble punishment he did get isn’t the correct feeble punishment for Abuse under current FEI rules. Disqualification, not yellow card, is the right sanction. This is set out in Endurance Regulations and was legally tested in a formal protest brought by me in 2014, the first of its kind, as a result of the running groom-horse beating incident at the CEI Sakhir, Bahrain. The Sakhir ground jury handed a yellow card for Abuse to the winning rider – which the FEI Tribunal changed to disqualification in hindsight. FEI HQ then sent a reminder about the correct rule to all officials in the fall of 2014. While anything goes in Group 7, you’d have hoped a FEI world championship staged in Europe would be more conversant with the rules. Obviously not. Maybe as Valeska wasn’t the winner and was vetted out, anyway, the Valeggio ground jury made an arbitrary decision that a yellow card was more useful. But I wondered why al Rowaie had not been disqualified as a matter of principle and I asked the FEI about it. To cut a long story short, although there is no dispute the Valeggio ground jury messed up, it’s a field of play decision and the FEI itself can’t correct it later. Is the yellow card still wrongly applied elsewhere? Of course it is. The “clean endurance” community is increasingly doing the regulators’ job for them, and kindly helped me look into other incidents since that 2014 memo was sent. In short, since 2015 18 riders have got away with a yellow card for Abuse when they should all have been disqualified, including one winner and two others with top 10 placings. In fairness, about 50% of horses were vetted out, or their riders disqualified for other stated reasons, but that misses the point. We then examined all the riders mistakenly yellow carded for “Incorrect Behaviour” this year, endurance-speak for arguing with officials at the vet gate. Under the new “demerit” scheme, they should all have been given 100 demerit points and an instant two-month suspension. Ten riders have thus enjoyed a lucky escape since January, including Isha Judd or Uruguay who won the Pan Am championship last month. Again, nothing the FEI can do in hindsight. How have so many slipped through the net? History does not relate, but having had this drawn to its attention, the FEI last week issued an unequivocal memo – yet again – to all officials. It has also devised an “Incorrect Behaviour” form to be handed to riders on the spot, with instant suspension for the avoidance of doubt. At least the demerit scheme is – mostly – working as regards other horse welfare violations. You can also accrue demerit points for breaking your horse’s leg, failing to observe mandatory rests, repeatedly causing your horse such metabolic distress that it needs invasive treatment by the authorised vet and so on and so forth. Accrue 100 points and it is a two-month ban. I say “mostly” because young al Rowaie seems unlikely to receive the prescribed 80 demerit points for breaking Valeska’s leg. As she didn’t die on site, she goes down as a “Minor Injury” (MI), which is not the same as a “Catastrophic Injury” (CI). The FEI is apparently now thinking up a third code for very serious injuries in which the ultimate fate of the horse is unknown as connections have whisked it off site before it expires. Emma Dimech (10142792), 26.10.2017 – 25.12.2017. Sheikh Rashid is also awaiting sanction for a doping offence. Incredibly, he once put himself forward as a suitable person to sit on the FEI technical committee. I am sorry this blog has quickly jumped from one topic to the next, but like I say, there’s still so much wrong with international endurance that you really don’t know where to start.